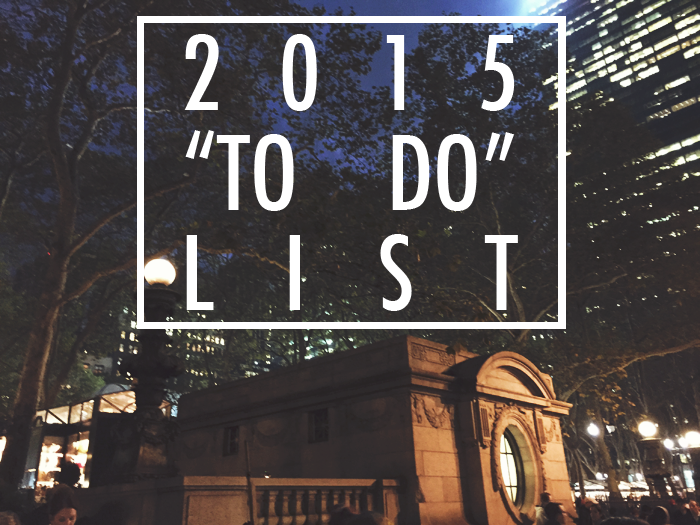 Well, 2015 is here and I think it's time for a new yearly to-do list. Without further ado, here are 40 things I'd like to accomplish or acquire during the coming year. 2. Watch Gilmore Girls in its entirety and fall in love with it all over again. 6. Seriously, go a day without your phone. It’ll be good for you. 7. Find an apartment that you love, or at least one that you can learn to love for the price. 8. Never stop writing, ever. 9. Pay for a Blogger template or learn how to do it yourself. 10. Get loans for school. 11. Learn how to cook a meal that isn’t rice pilaf or pasta. You’re an adult. Kind of. 12. Apply for an internship. 13. Attempt & complete NaNoWriMo. 15. Seriously, do some yoga. You’re a ball of stress 24/7! 16. Get a new, small Kate Spade cross body. Unless you can miraculously afford a Tory Burch Robinson tote. Then you can get that instead. 17. Work at a clothing store. 18. Get something you’ve written published. 19. See Taylor Swift on her 1989 tour. 20. Bake 5 new recipes and cook 5 new recipes from Pinterest. 21. Learn more about graphic design. 22. Attempt to vlog for a day, just for fun. 23. Eat at or visit: Mama Santa's, Mitchell’s Ice Cream, West Side Market and Sweet Moses. 24. Go to the Cleveland Art Museum and the Albright Knox. 25. Go to at least one Cavaliers and Indians game. 26. Create a recipe book. 27. Compliment somebody every day. 28. Play “i giorni” on piano. 29. Run twice a week during the summer, at least. 33. Own something Lulu Lemon because I’m all about that expensive trendy stuff. 34. Start reading and commenting on more blogs. Get involved! 35. Wear more skirts and dresses in public. It’s not as embarrassing as you think! 36. Find the perfect red lip. 37. Try out some DIY projects! 38. Ask more questions—in class, in conversations, in general. 40. See NYC at Christmastime. What is one resolution you made this year or something you hope to accomplish?